Democrats slammed President Donald Trump on Monday evening for considering revoking security clearances from former Obama administration officials, as they introduced a new resolution condemning the president’s statements during the Helsinki summit with Russian President Vladimir Putin. “It goes from the ridiculous to the sublime,” quipped Rep. Eliot Engel, Ranking Democrat on the House Foreign Affairs Committee. 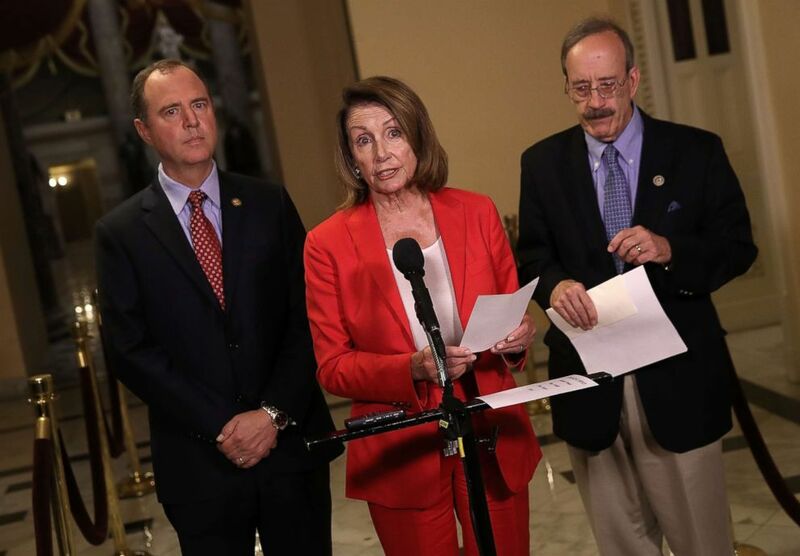 “As the whole world knows, one week ago, President Trump sold out our democracy in behavior that was damaging, destructive and disgraceful,” Pelosi, D-Calif., blasted at the start of the news conference. House Minority Leader Nancy Pelosi speaks at a press conference at the Capitol, July 23, 2018. The trio also called on Secretary of State Mike Pompeo to testify in the House, Director of National Intelligence Dan Coates, Secretary of Defense James Mattis, as well as CIA director Gina Haspel to testify on the subject before committees of jurisdiction in the House.